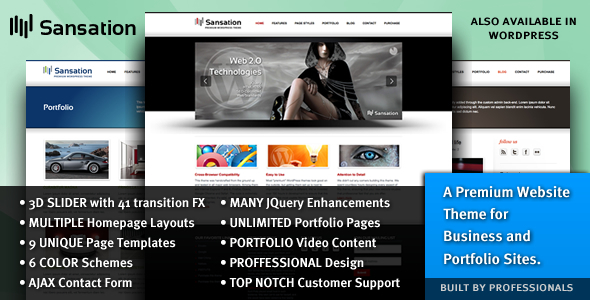 Sansation is a professionally-designed Website Theme. This theme is very clean, elegant and professional, and perfect for business and creative portfolio sites. It comes loaded with many impressive features such as a 3D image rotator, 6 color schemes, 9 unique page templates, Built in AJAX Form, and so much more. We didn�t waste our time trying to impress you with off the wall functionality that you�ll barely ever use. Instead, we focused on providing you with a powerful wwebsite theme that is feature-packed with everything you�ll ever need to run a successful website. Sansation shines where many website themes fail: Usability. The design is super clean, customization is an absolute breeze, and most importantly it�s a website theme you can actually use. In march we "Intro"duce our new template Intro. The clean and light design is predestinated for setting up a blog, a portfolio or any other content of your choice! The template comes with a very clean and open design, only wrapping the articles in boxes to put your websites content into the visitors focus. Most of the template colors can be easily customized by just editing CSS and the use of only a few images will accelerate template loading time. We created some new module styles for this template, like the new styles for the submenus and the YOOtweet module. The new module class suffixes for the ribbon header and the stamped style of modules complete the brand new look of this template. The template comes with 12 new color variations with subtle colors to match every kind of content. Welcome Enterprise, our new April template. It comes with a very clean design, which perfectly fits for your website. Very easy to customize, this template will match your corporate or favourite colors in a breeze. It also includes new styles for the Twitter module, YOOcarousel and lists. Our new Enterprise template is perfect for creating a business-, news- or sports website. Find out more cool features of this cool template. iJoomla News Portal turns your existing sections, categories and articles into a live news portal. Within minutes, you can own a news site that�s as professional and appealing as CNN.com or FoxNews.com! Designed specifically for Joomla! CMS, iJoomla News Portal is the ideal solution for any site displaying news content. The portal can work as a home page for site dedicated to news or as a news section within a general site that makes breaking information an easier read. Professional Joomla! Administrators need a professional Joomla! administrative template. Stainless adds features, flexibility and style to all the right places in your admin panel. Optimizations for K2, FLEXIcontent, Projectfork, Tienda, and VirtueMart, along with custom options make Stainless the right fit for just about anyone. Website �Captcha� verification to reduce and prevent spam + spam bots from posting and submitting spam via Joomla. Increase your joomla sites security, reduce it�s vulnerability against attacks at the source! This script allows you to automatically pour images inserted in the publication on your website and stored on other servers (free kartinkohranilischah, other sites, etc.) on your server. This may be the same server that is hosting the site itself or any other server that supports ftp. Style the webshop up directly from Joomla using your favorite editor as if you where making articles or other content, need a new field for some products? Well create one or more new fields and include the new tag you get when you create a field into the template the product uses or make a new template and create the new field tag in � and there you go new fields right there in the administration for your product and on the frontend too � Its never been easier than that! Mosets Tree is a directory component for Joomla!. You can use Mosets Tree run a complex Yahoo! style directory directly inside your Joomla website. Mosets Tree is designed to handle any data that requires a directory structure such as a business directory, links directory or scripts directory. Because Mosets Tree runs on Joomla!, you have infinite possibilities to include more features to your website by using third party extensions from Joomla! Extensions Directory. PHP Login & User is the MySQL powered website PHP login script, another high quality script designed and created by Jigowatt exclusively for ThemeForest. It features changable User Levels via the Control Panel incase your website requires different levels of page security amongst loads of other useful features! * E-Mail Address validation, avoid false signups! * Disable/Enable entire user groups in seconds! * Edit existing user details, levels, restrictions etc. * Live Demo speaks for itself! Try it out! The Efficient theme currently works with Drupal 6.x, so the following modules need to be downloaded and installed in order for the theme to function properly. Note: We would advise only downloading and using non-dev versions of each module as these are typically the most stable. Content is king! The Scoop template is the ideal solution if you want to create a news site, magazine or blog. If you need an unobtrusive template that does not distract your users but makes them focus on your content, go and get the Scoop template! It comes with 9 different menu colors and 6 background variations which can be combined together. It is also a real lightweight. The Scoop template is almost entirely styled via CSS and only needs very few template images which makes it load super fast. Also you can customize it very easily: Almost all design changes can be made via CSS so you will hardly ever have to modify any images to change the look and feel of your site. JomTube Video Gallery is the most Powerful Video Extension made for Joomla 1.5x Content Management System (Joomla Video Component) which will allow you to transform your Website into a professional looking Video Gallery with functionality that is similar to YouTube.com. JomTube Video Gallery extension video gallery and has been created specifically for the Joomla 1.5x (MVC) Framework and can not be used without Joomla 1.5x as Jomtube is an extension of Joomla and not a stand alone application. JXtended Comments 1.2.1 RC2 for Joomla is now available for subscribers to download. This version now includes 50 of the most popular social bookmarking sites as well as other new features and bug fixes. JA Google Translate lets you add google translate feature to individual articles without refreshing the page or redirecting to google translate url. Translation happens on the fly. It is based on the Google Ajax Translation feature and can be installed as a normal plugin. Easy to use and easy to understand. Detailed tooltips added to each option for easy understanding of features. Its so easy to use, that a userguide was not felt necessary. Try it to believe it. New powerful free unique component for building and managing content on the site Joomla. With this component you can: manage the content (materials, categories, sections), manage users, create a unique appearance and content to add any number of wanted forms. The component has a built-in registration, contacts and most importantly a small community! Component allows you to create multiple forms for any purpose. When you upload photos automatically creates a mini image (Thumbs). There import \ export. Thecomponent has the support of their plug-ins and modules + full integration with all regular components of Joomla. 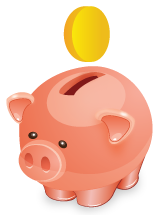 There are many credit default templates, such as blogs, categories, portfolio, etc. As stated by the developers it would be the best product in this area and completely surpass K2 and JoomSuite. In general, that describe, install and evaluate the work of thecomponent itself.